Adidas Rockadia Trail Review - Buy or Not in Apr 2019? As one of the world’s most popular brands (second to only Nike in worldwide sales), Adidas has been committed to the science of shoemaking for nearly a century. In fact, it’s a good guess to say that nearly everyone you’ve met has owned at least one pair of shoes from this iconic brand sometime in their lifetime. That being said, Adidas isn’t usually the first brand that comes to mind when you’re looking for a reliable, tough outdoor shoe, until today, that is. With its aggressive grippy tread and outstanding construction, the Rockadia Trail Runner has become an instant standout for the Adidas line. Plus, with an entry-level price tag, it’s no surprise that the Rockadia Trail Runner ranks at #55 in worldwide Adidas sales. So what sets the Adidas Rockadia Trail so far above its similarly priced counterparts? Read on to find out! The Adidas Rockadia trail comes equipped with Traxion outsole for extreme grip. Interestingly, Traxion outsoles were initially designed for football players, but have also been used by golfers and hockey players. Their tapered shape and lack of studs allow you to gain secure footing on turf without all the pressure that studs place on the foot. Plus, their unique lug system grips without slipping even on highly unstable surfaces like mud, loose dirt, river stones, and trails with brush obstructions. The tread itself is comprised of an intricate series of flex grooves, textured lugs, and aggressively deep chevrons that follow the natural contours of the foot. 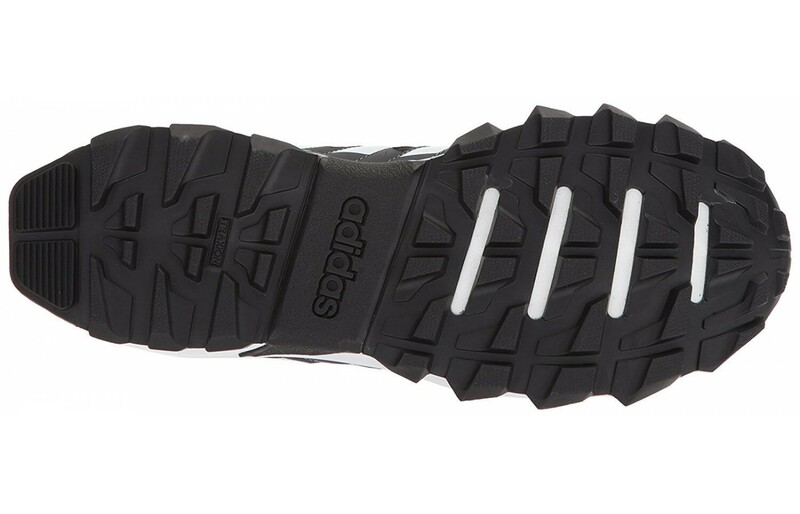 The tread also features Adidas' Mud Release System with rubber nips - ensuring you get the most traction possible with every step. The second pleasant surprise to come from the Adidas Rockadia Trail Runner is their all-new Cloudfoam technology. Cloudfoam midsoles are constructed from a relatively new EVA compound that adds a walking-on-air feeling to the ride of these shoes. In addition to this new EVA tech, the Rockadia line also showcases a specialty heel pad and an internal support system connected directly to the midsole that seamlessly allows for heel and arch support. Lastly. the unique closed-cell structure of Cloudfoam technology adapts to your foot as you wear it. That means, that unlike other midsole designs the Rockadia's Cloudfoam will compress ever so slightly in your first few days of wear to conform to your natural arch shape. Ultimately, that means a custom-fit experience with every new pair you wear. Don't be discouraged, however. This molding process shouldn't be uncomfortable or painful as "breaking in" your shoes. They should provide immediate step-in comfort. The uppers of the Adidas Rockadia trail runners are extremely cool and lightweight thanks to their rugged mesh design. Plus, since this mesh has a slightly thicker synthetic yarn, the Rockadia trail runners are near rip-proof. Stitched leather overlays add durability and a degree of brush protection. That doesn't limit their breathability however as vents strategically placed along the toe box and quarter overlays for additional airflow. Plus, thanks to the Adidas Rockadial trail runners' distinct rapid lacing system with dual heel locks, these shoes deliver a stable ride no matter the terrain. Lastly, an OrthoLite sock liner eliminates the need for costly inserts and adds yet another dimension of breathability to this shoe. Overall, the uppers of the Rockadia line are just as highly detail oriented as their tread counterparts. 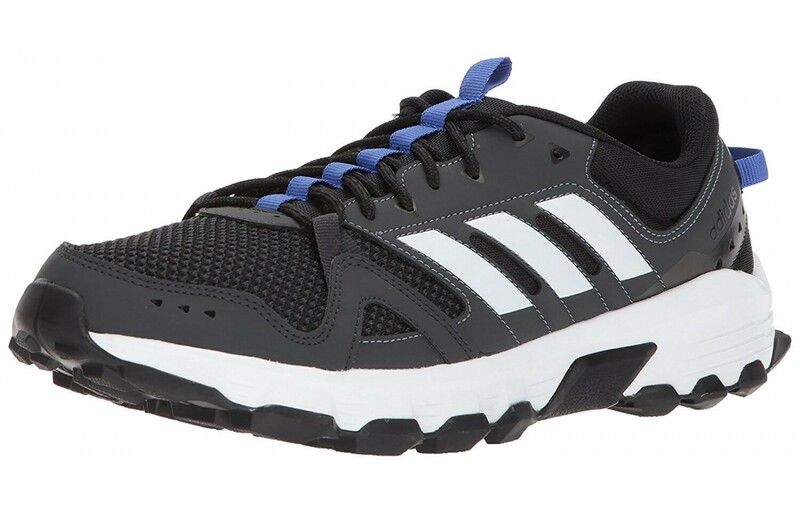 Adidas Rockadia Trail Runners weight approximately 9.6 ounces (size 7) and ships at about 3 pounds. For a trail shoe that offers such a high degree of traction, the Rockadia is surprisingly lightweight. If you're still stuck on tracking your PD times, the Rockadia Trail Runner's lightweight design and mesh uppers will prevent premature fatigue as you cross trail after trail. One of the key features of any trail shoe is its overall breathability. After all, the last thing you'd want to experience on a remote trail is an agonizing blister caused by damp, sweaty feet. Thankfully, the Rockadia Trail Runner has a full mesh upper and vents on the forefoot and quarter. Plus, the Rockadia also has a distinct midsole that's not only capable of allowing air to circulate the foot, but that actually helps to wick moisture away from your feet. All in all, the Adidas Rockadia line offers far more highly specialized breathability features for runners despite their affordable price tag. Rockadias' OrthoLite sock liner is also extremely comfortable and durable. That's rather surprising considering it's one of the first slow recovery foam midsoles in development to be made with 50 percent biodegradable oil! The Cloudfoam midsole and built-in heel cushion also add yet another layer of comfort. Although you might not want to stand all day at work wearing these shoes, they're excellent for hiking, trail running, exploring, and camping. Typically it takes a lot for a shoe to strike me as very stylish. It has to be almost too over-the-top or completely minimalist. However, the Adidas Rockadias may have just changed my mind. Their design is somehow aggressive, yet modern; edgy, yet functional; fashionable, but serious at the same time. In fact, many other runners who purchased this shoe got a similar response from their peers, garnering compliments from strangers about the great design of these shoes. Plus, and this is another one of my picky buyer's points: this shoe comes in a huge array of colors. Women’s colorways include the colorways Carbon/Raw Steel/Trace Scarlet, Trace Purple/White/Core Black, Black/White/Easy Orange, and Grey/Black/Pink. Whereas men’s colorways include the colorways Carbon/White/Hi-res Blue, Black/Black/Dark Grey Heather, Black/Black/Energy, Core Black/Matte Silver/Carbon, Dark Grey/White/Electricity, Collegiate Navy/Matte Silver/Solar Orange, and Grey/White/Royal. With so many colorways to choose from, it's no wonder many people return to these shoes over and over again. 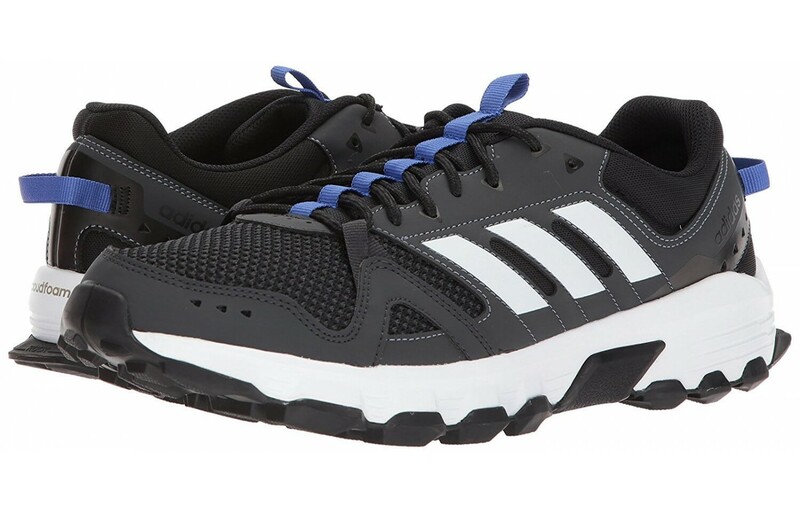 Many runners have found the Adidas Rockadia Trail to be durable and long-lasting. This comes from, at least in part, their surprisingly tough upper mesh and overlapped stitch-reinforced overlays. Moreover, it may be that this new EVA compound used in the midsole has a higher level of durability than other compounds. Also, since the Adidas Rockadia is made with a premium rubber sole and unique lug system, they're able to survive through nearly any terrain you can throw at them. Overall, wearers report these shoes lasting for six months or more of extremely heavy wear without issue. What would a trail shoe be without adequate protection? The Adidas Rockadia Trail Runners boasts a protective toe cap for downhill traction and rugged mesh uppers for brush protection. Plus, other testers found that the extra stability in the heel helped to prevent unnecessary ankle rolling. Although these shoes won't be able to protect you from more insidious trail hazards like toxic plants and wild animals, they're sure to provide traction on slippery mountain slopes, sudden drops, and minor obstructions. 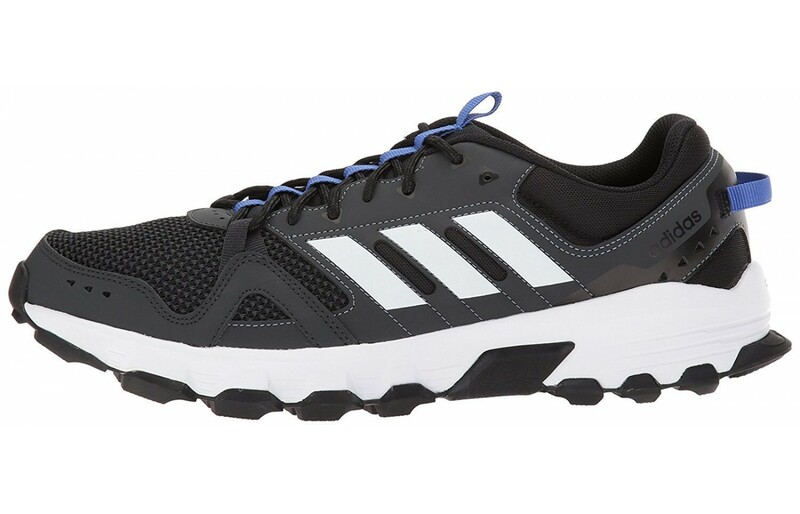 The Adidas Rockadia Trail Runner is also fairly responsive. Many trail runners appreciated the reliable grip the outsole provided on uneven surfaces. In fact, some even pointed out that this shoe could potentially be used by paddleboarders and cave explorers because of its ability to provide reliable takeoffs even on slick surfaces. Rockadia Trail Runners, although considered by many to be neutral trail shoes, provide a customer support system that cradles and supports your natural arch. Plus, their optimally placed leather overlays provide a high degree of support in the midfoot where most slippage is prone to happen. This attention to detail when it comes to comfortability and rugged support is one of the easiest ways shoe manufacturers can help runners avoid knee injury and other avoidable sprains. To top these designs off, Adidas has chosen to add a hidden supportive frame within the backstay to offer yet another degree of all-around foot support. These trail-tested running shoes have a grippy rubber outsole that helps runners maintain traction on even fairly remote or overgrown trails. The outsoles of the Adidas Rockadia are built to withstand the foulest off-road trails. That's because their unique flex grooves and lugs offer superior traction in slippery, loose, rocky, and unstable trail zones. This is a bargain trail shoe from Adidas. If you're interested in taking up hiking, trail running, or backpacking on the weekends, the Rockadia Trail Runner line offers exceptional design at a price point that's far from intimidating. The Rockadia Trail Runners feature an intense Traxion outsole that offers superior grip in every direction. With its deep, narrow, triangular shaped lugs these high-traction outsoles have been used in a wide variety of sports that require steady footing including hockey, golf, and football. Thanks to their mesh upper construction and closed-cell midsole, the Adidas Rockadia Trail runners are highly flexible and versatile. They bend freely in response to both shifting terrain and your movements with hardly any resistance. Though it might seem a little counter-intuitive, this high degree of flexibility is a great thing to have on a trail or rock climbing shoe. That's because (typically) our bodies respond just a little faster than our brains while we're out on those deeply meditative adventures. You trip on a low lying root, and your body switches into an automatic response - what happens then? Well, when you're wearing a highly flexible and grippy shoe like the Rockadia and your foot comes back down for a landing, your foot will be able to flex and splay its toes naturally. With more rigid shoes that are less responsive, this same incident could easily result in (at the very least) a minor injury. 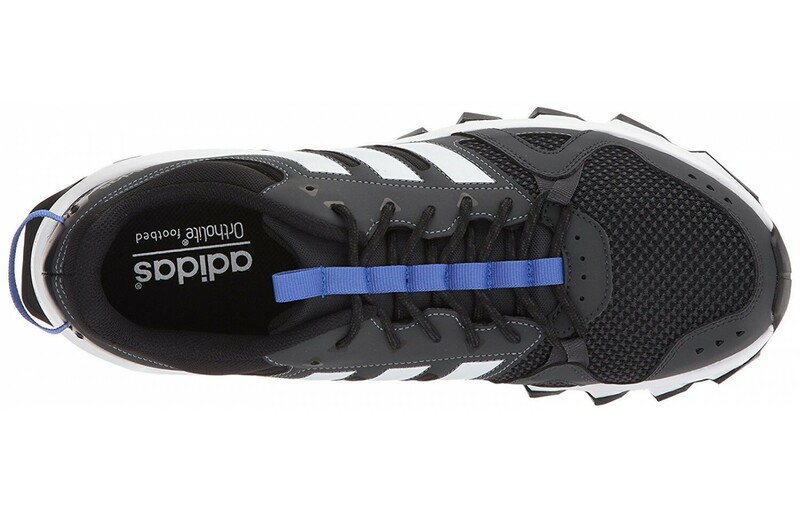 The Adidas Rockadia Trail runners also showcase a synthetic heel piece for stability placed inside the backstay. Leather and synthetic mesh overlays provide additional midfoot stability, while the outsoles (as I'm sure you've already taken note) provide fantastic traction. Runners also attest to the level of stability the Rockadias provide. In fact, some claim this new line to be just as effective in its "anti-ankle-twisting-technology" as the far more expensive releases from New Balance. The Adidas Rockadia Trail have a drop of 10 mm. This is actually a surprisingly steep drop for a trail shoe but comes as a result of all of that cushion in the heel and midsole area. If you wear maximalist trainers or are transitioning to neutral drop shoes, these might make an excellent addition to your gear set. The Adidas Rockadia Trail Runners have a laundry list of great qualities I look for in a high-quality hiking shoe. The only slightly negative feedback I've been able to find in relation to the Rockadias is that the Men’s shoe width is listed as D (medium/standard). However, actual fit feedback seems to indicate width may be closer to B (slightly narrow). Not only have those with wider feet have reported needing to purchase a size up, but the women’s line is listed as B - it’s highly likely the color, not structure, was changed for this unisex line. This minor fit issue can be easily resolved by either wearing a half size larger shoe or a full size larger shoe (with multiple pairs of socks). I highly recommend all new purchasers of this line to refer directly to the sizing measurements available from your seller. 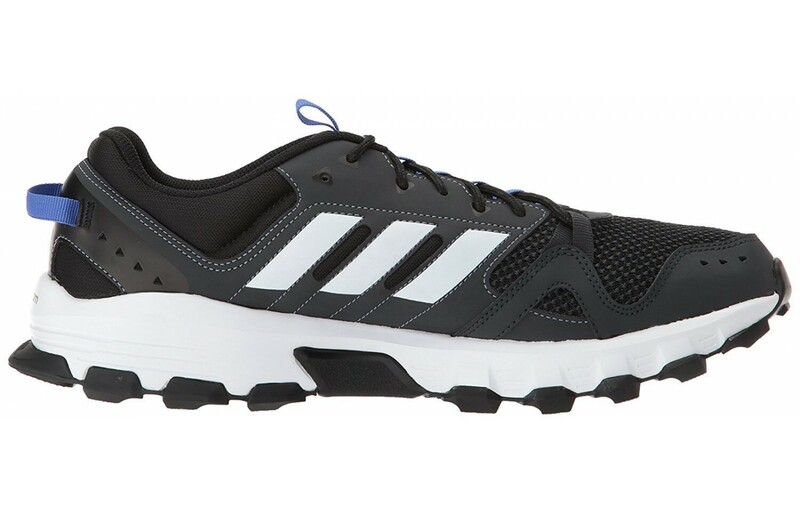 Other than this flaw in sizing disclosure - which (frankly) happens with surprising frequency in the athletic shoe industry - the Rockadia Trail Runners is an amazing deal for the level of quality and commitment Adidas has demonstrated in this model.